This Specialized Allez sprint bike is in excellent condition. However, having been lightly used, there are some small signs of mechanical wear on the drivetrain. The bike has also picked up some minor cosmetic defects on seat tube, chain stays, cranks, bars, forks, and bar ends. The most advanced Alloy road bike, ready to race to the podium. 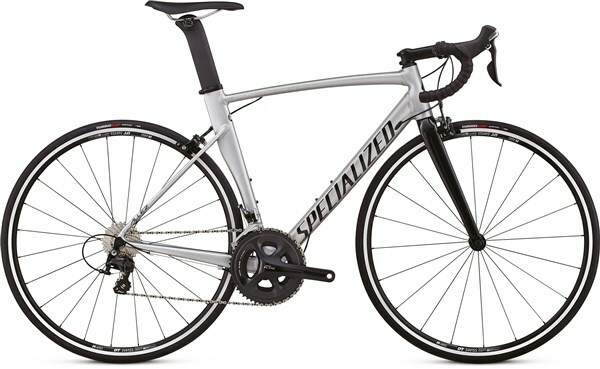 The Specialized Allez Sprint Comp is a rapid road race bike that was designed specifically for crit racing yet offers versatile everyday road bike performance for those that like to ride faster. E5 Premium Aluminium frame with Allez D'Aluisio Smartweld Sprint Technology refocuses weld locations, allowing for more material to be placed where it's needed for increased stiffness and compliance where you really need it. Our top-tier S-Works FACT carbon fibre fork offers incredible stiffness and front-end steering response, while also efficiently absorbing road chatter. The Venge FACT carbon fibre seatpost acts as a stiff, aerodynamic perch for your saddle.